Proteomics screen of islets under proliferative conditions reveals activation of UPR without ER decompensation. (A) Proteomics screen on islets after 4 days of in vivo hyperglycemia suggested activation of secretory-pathway peptide synthesis and UPR. (B–E) RNA analysis of islets after in vivo glucose exposure confirmed activation of UPR (BiP, Atf6, sXbp) without decompensation (CHOP; n = 4–8). (F) Immunoblot confirmed increased proliferation (PCNA) and increased sXBP and p-eIF2α at the protein level (n = 4). PCNA band is seen in the p-eIF2 blot because PCNA was probed first and the membrane was not stripped. Quantifications of immunoblots are in Supplemental Figure 1. 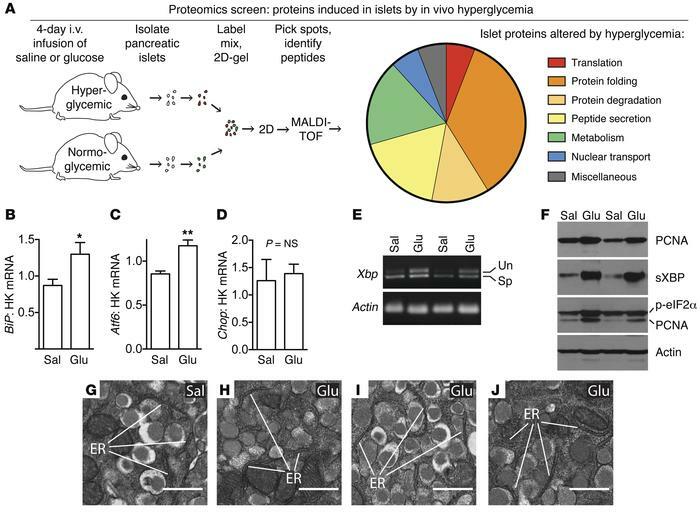 (G–J) Transmission electron microscopy of pancreas after infusion showed normal, nondilated rough ER in β cells in hyperglycemic mice, confirming the absence of decompensated ER stress (representative images; n = 3 glucose infused mice [Glu] and n = 4 controls [Sal] were evaluated). HK, housekeeping gene. Data are represented as mean ± SEM; *P < 0.05, **P < 0.01 by Student’s t test. Un, unspliced; Sp, spliced. Scale bars, 500 nm.